PassTime on a smaller map with other balance experiments. Cuisine - PassTime on a smaller map with other balance experiments. 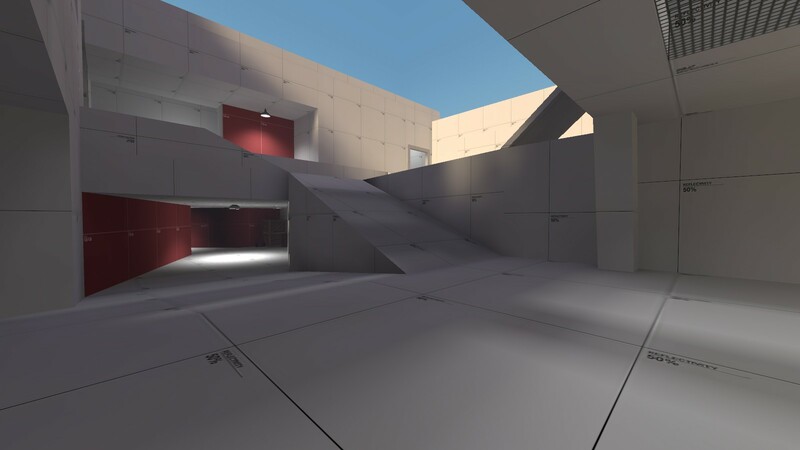 This map comes from pd_cuisine but has been altered to be smaller and faster for teams to hit the front-line battle after respawning. 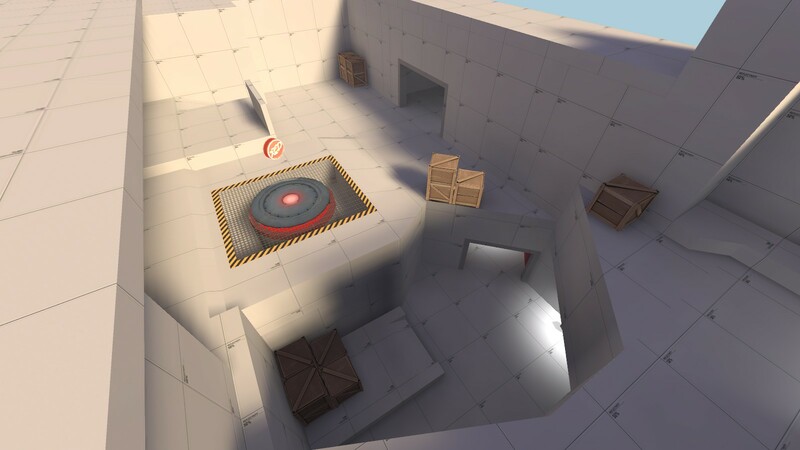 There is a dispenser attached to the jack for whichever team holds it, and to capture a ball you need to capture the enemy control point before the zone is enabled (before subsequently being reset after the goal). Capture the jack in the enemy goal 3 times to win. Follow the development of the map with my youtube playlist of patch notes and thoughts: Link. I'd like to point out that one big reason why PASS Time maps are as large as they are is to make the act of passing the Jack really valuable. If everyone's bunched up, then there's really not much use in using a Jack over a flag; making it a Jack just prevents whoever's holding it from really contributing anything. Also, I'm guessing adding a Dispenser to the Jack is just going to encourage people to hog it instead of passing. In fact, the devs apparently have considered having the carrier catch fire after holding it for too long to encourage greater teamwork in Jack management. Look forward to playing on this, though! I haven't gotten to play on any original community-made PASS Time maps yet. I think that the map currently supports enough flanking, especially through the bottom route, that passing still offers enough benefit and uniqueness to the gameplay. For instance the low route currently has a shallow ramp downward from the middle of the map, making the ball easy to throw and roll with extended velocity quickly into that section of the enemy zone. However the low route also takes the longest to walk upwards to the control point. But if you had a teammate up top on the control point you could simply throw the jack up from the low route! Also, I'm guessing adding a Dispenser to the Jack is just going to encourage people to hog it instead of passing. I think you might be right, but also that it's not too much of a bad thing. Still experimenting on that. I like the layout quite a lot, though I have no idea what I'm doing in passtime. At least once, someone threw the ball to me from behind and I immediately threw it directly at the enemy since I was already firing stickies at them. The lower area near the last point feels like a death trap. Could stand to have a second way up considering how far down it is. If there already is a second way up, it could be more obvious -- I walked down there from mid, couldn't see an immediate way back up, and turned around before everyone above me on last decided to jump on top of me. The last points feel like they should cap faster, given how hard it is to push into the last area -- two chokes leading in, both pretty spammable, and the enemy spawn is immediately behind. Or... perhaps you could move the last point closer to the mid side of the last area and keep the cap time the same, though that might create frustration with people coming out of spawn to defend and simply not reaching the cap in time to stop it. Since this map was in the later part of the impromptu, the map got around 12-16 players. I do not think this a bad thing though, as playing this gamemode with that few people actually seemed to be funner than any of the current official pass time maps so far. The reason for this is that it seemed to allow a group of 4-6 people group up on the ball carrier (who also healed at lv.2 dispenser speed) and create a natural, non-communitative teamwork among everyone. It felt as though ball advantaged groups wanted to push more as a group than as an individual and, as far as I can tell, that isn't always commonplace in what can be considered a pub full of people competent at tf2. You were there too of course, I merely wanted to give an observation on that as I thought it was something very unique as opposed to what goes on in any other map, official or otherwise. You should definitely look into other ways to promote a team effort in the same ideal of the dispenserball. I kinda think the map might play a bit better if it's at most a team of eights, instead of a team of twelves. I wouldn't know for sure though, as I just haven't played the map with a full server. Current stable version. Needs more testing. - dramatically increased respawn times when ball was in your zone. new times are 6 for attackers, 12 for defenders. - ball always has an outline now. it's a bit buggy but it's the best I could come up with at the moment. - everyone will respawn when the ball is capped instead of just the people who had capped. - opened a window at mid to let players who went high for first fight interact with objective quicker. - made that one route near side of spawn get a grate wall instead of a solid wall to make it more visible. - fixed a bug where players could throw the ball out of the capture zone just as they captured the point to negate the capture. - added 5 seconds to respawn delay to help teams both get to mid easier. - reduced defender respawn time by 3 seconds (when jack is near your base). - made the 'jack is near your base' trigger's position less arbitrary, now is on top of geometry. - added a sound cue when the jack exits / enters your base - affects your respawn time. 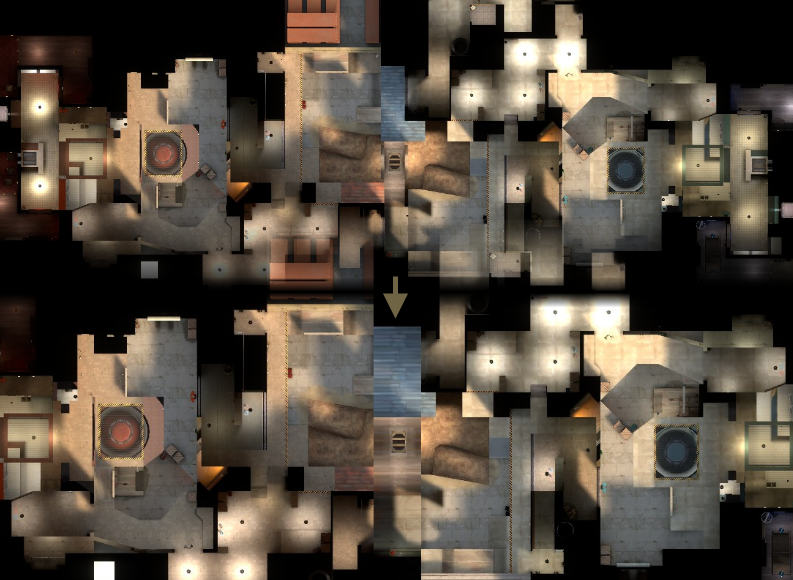 - added a route from capturepoint to the high route that also blocks a sniper sightline to the spawn door. - nerfed high sniper position on mid, also nerfed a sentrygun spot near the chokepoint. - Top route to bypass choke / mid sightlines. Has small healthpack. - Minor changes to sightlines from low sewer entrance to cap area. - Started theming the map with textures, probably 80% done that, detailing overall like 20% done! aa Nicky Lets try something new! Rev up those fryers, cause I am sure hungry for some sick cuisine on cuisine action! The detailing already looks really good! I would really appreciate chain fences on each side so I can get a better view of the pier and city respectfully. The concrete and dirt textures near mid feel really good too... however It's kind of unusual how there is a mining facility in the dead center of two restaurants (why are they mining between an ocean and city, by the way?). Their architecture is connected almost like they are part of the same building, too. maybe find some way to section them off so they look like separate businesses? Also, The word you were looking for was neon sign! - Added hazardstrip tape to where the boundaries that change spawn times are. - Made it so if the round ends and a team is in the lead scores-wise the round skips overtime. Overtime now only happens if team scores are equal. So much this. I'm a little surprised that the official beta PASS Time still insists on making everything overtime, even if one team is up two points and is guaranteed the victory either way. 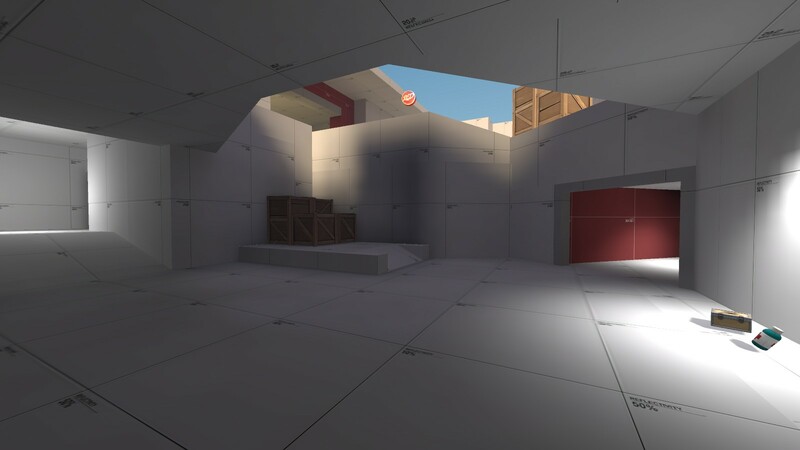 Also, you clearly have a pretty strong vision for the map's theme, and I very much respect that, but you might want to be a little careful that the map's aesthetic doesn't end up being too reminiscent of that of Warehouse. The three official PASS Time maps so far (the third of which being the upcoming King-style map) all have really different looks. If Cuisine someday becomes an official map (fingers crossed! ), then I would really want for it to be sufficiently visually distinct from the other three maps. In particular, using slightly different prominent textures from those of Warehouse would go a long way. We did a test of a20 today and even though the map is in the detailing phase I'm only now starting to see how I can / that I might need to expand it. The feeling comes not only from the congestion of the gamemode elements (icons on the screen, speed boosts, parented dispensers and dynamic spawn times), but also how short the distance is between the two bases - it doesn't really feel like you're pushing into the enemy base. Also plan to increase round time from the experimental 8 minutes to 10 minutes (a17 used to have 12 minutes) because it was too short simply. Your most resent update was borked. I have some mapping content on my Youtube channel! Don't forget that PASS time was also updated in MyM, meaning new features like "move-as-a-pack" bonuses could cause imbalance. Probably nothing too big to worry about, though! Once again we have a prime example of mistaking the door frames for part of the door, and it's not the only one on this map. I realize this is just a mockup of how you want it to eventually look (at least, I sure hope so, judging from those metal beams), but it's just something to keep in mind. I actually made a custom elevator door texture back in the day that I could offer you, but it was designed to go with the spytech walls. These light fixtures are interesting, but where are the lightbulbs? Are they inside that inner "bowl" facing up or something? Either way, there seems to be too little light coming from them judging by how bright the inside of the shade is.